This blog post was written by Higher Employment Services Technical Assistance and is included as an archived post on the Switchboard blog. A common misconception in our field is that higher paying jobs are not available without a Bachelor’s Degree (BA). According to the Good Jobs Project, however, there are 30 million “good jobs” across the United States that pay well and do not require BAs. Knowing where to find these jobs can assist employment staff and refugees in identifying career pathways that do not require expensive four-year degrees. A “good job” is defined as one “with earnings of at least $35,000 annually for those under age 45 and earnings of at least $45,000 annually for workers age 45 and older.” The 30 million good jobs that don’t require a BA identified by The Good Jobs Project have median annual earnings of $55,000. Even though a BA isn’t needed for these jobs, researchers found the best-paying positions still require some education. Training, such as associate degree programs or trade skill certifications, may be necessary to secure a good job. When discussing career planning with refugees, it is essential for employment staff to explain the difference between BA education requirements and associate or technical education requirements. The Good Jobs Project, completed by The Georgetown Center and JPMorgan Chase, includes a website and report analyzing the job market across the United States. The narrative report shows what careers are available state-by-state without the need of a BA through analysis of US Census Bureau and Bureau of Labor Statistics data. 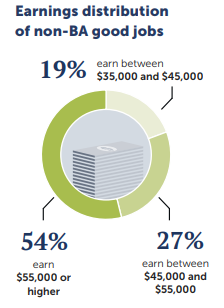 Source: Georgetown University Center on Education and the Workforce. In addition to the narrative report, the user-friendly website offers data on good jobs that can be filtered by industry, education, occupations, geography, and gender. To learn more about the methodology and resources, click on the main menu drop down feature on the top right hand of their website. As refugee employment professionals, understanding labor market information like that included in The Good Jobs Project can help you locate career pathways or “good jobs” over lower-paid, survival jobs. 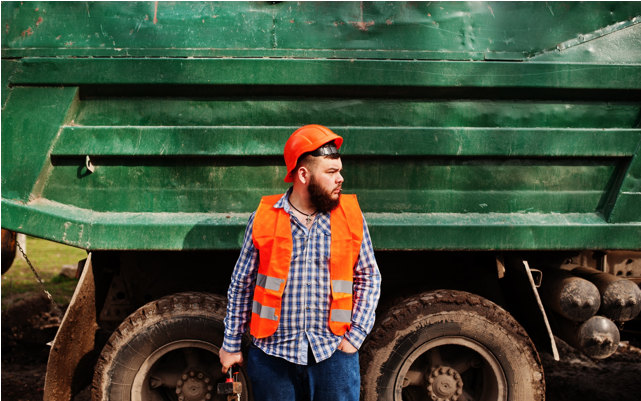 For example, a job developer in Illinois might decide, after reviewing the data from the Good Jobs Project that their team has not tapped into the Transportation and utilities field and could be missing out on opportunities for their clients. For more information on educational requirements for specific sectors and occupations, check out to the BLS Occupational Outlook Handbook. Another tool for researching particular industry sectors is CareerOneStop, where you can find a directory of employers, career guidelines, training programs, and local resources. National division of non-BA good jobs.